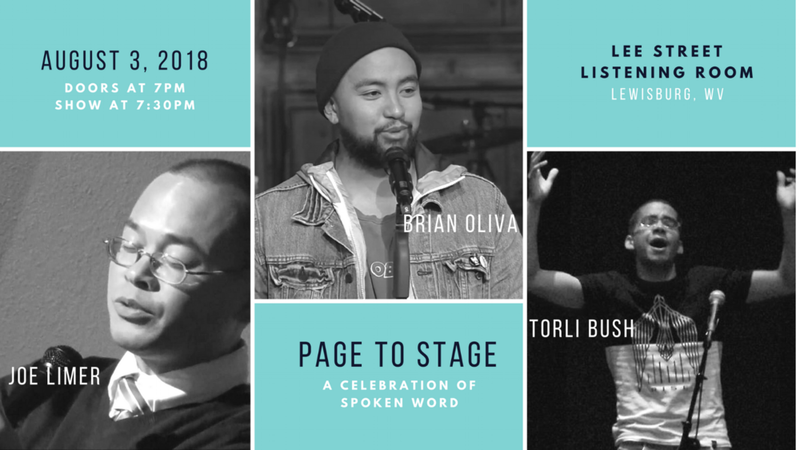 Champion slam poets Brian Oliva, Joe Limer & Torli Bush come to Lewisburg, WV for an evening of performance poetry like you've never seen. Make this your first stop in a jam-packed weekend at the Lewisburg Literary Festival. Doors open at 7pm and the throw-down begins at 7:30. This event is free, but donations made the night-of will go to the artists and off-set venue expenses. Brian "SuperB" Oliva is an accomplished writer, and spoken word artist with a touch of R&B and soul. He has featured at countless venues. He is a co-founder and co-host of Urbane Culture—one of the most successful open mic venues in Pomona. SuperB is the 2009 and 2010 Inland Empire Grand Slam Champion; member of the 2009 and 2010 I.E. Empire Mindstate Slam Team, where in 2010 his team took 2nd place in the National Poetry Slam Group Piece Finals. In 2012, SuperB appeared on TV1's poetry and music series "Verses and Flow" as one of the second season's featured poets. Through his love of the art and community, SuperB travels as a performer, advocate, and mentor. Sharing and conducting workshops to enrich the art. SuperB was the coach of Azusa Pacific University's first-ever slam poetry team, and currently works with the Ontario Montclair School District to build excitement for poetry and coordinate a district-wide annual Poetry Day. Born in Hawaii, raised in Clarksburg, West Virginia, and currently living in San Diego, Ca., Joe Limer is a 4-time national poetry slam competitor on teams that have regularly finished in the top 10. He is on the current San Diego team that will be defending its national title in August in Chicago. Joe is the first Long Beach Poetry Slam champion to win 3 years in a row. He has also won slams in Encinitas, Ca., Oceanside, Ca., Honolulu, HI, and Pittsburgh, Pa. He contributes to the state that raised him by being a member of West Virginia Writers and running workshops during its annual summer convention. Joe has won multiple awards for poetry at WV Writers and was published in “Voices on Unity” by Mountain State Press. Torli Bush is a poet from Webster Springs, West Virginia. He is a mechanical engineering alumni from WVU and began his performing career in the spring of 2016 at Steel City Slam in Pittsburgh. He has since performed in several slams, most notably the 25th Annual Southern Fried Poetry Slam in Louisville, KY in June of 2017. He has also recently been a panel feature at this year's Governor's school for arts and featured with Travelin Applachians Revue. His writing styles often focus on spirituality, social commentary, narratives, and Appalachia.